After my husband and I were first married, we probably went out to eat 3 times a week. So bad, I know! We were both working full-time and he was going to school so it was a lot easier to go out. Now with a toddler and another baby coming real soon, we don’t get out nearly as much. I love finding recipes that taste similar to those you would find in a restaurant, because heaven knows I love to eat out, and this dish is one of them. 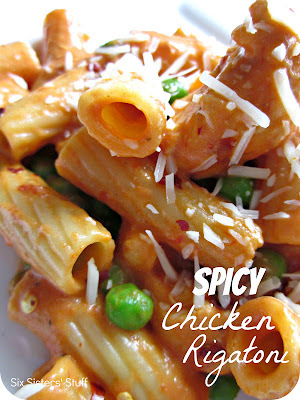 I’ve heard this recipe tastes so much like the Spicy Chicken Rigatoni you would find at Bucca Di Beppo! It was a little spicy for the toddler but my husband and I were big fans! With marinara + alfredo, plus grilled chicken and peas, I've heard this recipe tastes so much like the Spicy Chicken Rigatoni you would find at Bucca Di Beppo! Sprinkle of fresh Parmesan cheese and a pinch of red pepper flake for garnish. In a large skillet on medium-high heat, heat two tablespoons olive oil. Saute garlic, red pepper flakes, and coarse black pepper for 2-3 minutes. Add in thin strips of chicken breast, 1/4 teaspoon salt, and cook until chicken is cooked through. This should only take a few minutes because the chicken is cut thin. Add in marinara sauce and stir. Add in Alfredo sauce and stir. Let the sauces simmer for about 10 minutes. To the sauce, add two tablespoons butter and 1/2 cup peas. Stir until the butter melts. Combine the sauce mixture with cooked pasta. Garnish with fresh Parmesan cheese, and a pinch or two of red pepper flake. Looking for more delicious pasta recipes? Yum! A lot of times when a dish calls for peas, I actually stir them in last minute when they are still frozen. The peas warm up, but are still firm, flavorful balls that kind of "pop" in your mouth. This dish sounds DE-LISH, I'm pinning it now! I love pasta in almost any form, and this sounds DELICIOUS! I love that it has a little spicy kick to it. I'll definitely have to try it out! Made this exact recipe from someone else last night. It was GREAT! Have it for left overs today :) Very easy to make and definitely has a kick to it. I love Bucca di Beppo, and this looks absolutely delicious! We go out to eat way more often than we should right now, but this looks easy enough that I might actually try cooking it one night instead :-) I have a brand new link party going on right now and I'd be thrilled if you'd link this up so everyone can try it! Ditto to Megan's comment - I JUST made this last night!! It was a success because everyone liked it which is so rare around here. Thanks for sharing - your readers will love it! I want this for dinner tonight. YUM! Made this for girls' night in, everybody loved it! I did 3 cups marinara and 1 cup alfredo for more of a tomato taste. Great recipe! Store-bought alfredo is wretched - real dairy rancidifies too quickly for a jar, so you're essentially putting non-dairy creamer on your pasta. If you can make a roux, the homemade version takes only a few minutes and is much better - and significantly less expensive. I agree, store brought alfredo is pretty awful. However, follow this recipe and you've got a definite winner. Great flavor, (use the good stuff). As for real dairy turning rancid in a jar, it has a long shelf life in a plastic container, so I tend to believe it has a long shelf life in a jar. And just an FYI; making an alfredo sauce is a bit more involved than just making a roux. Joseph, if you choose to make your meals completely from scratch, have at it. Find a recipe website that caters to your preferences. And don't make snarky comments to the rest of us. Not all of us have the time or desire to take the time to cook everything from scratch and we enjoy the recipes that cater to us. I think this recipe sounds delicious. Can't wait to try it. So happy I came across this recipe, it was simple, easy and delicious!! Only thing I did different was use a little less red pepper flakes than what recipe called for and my husband loved it! Hi! I'd love to make this recipe.. How many does this serve? 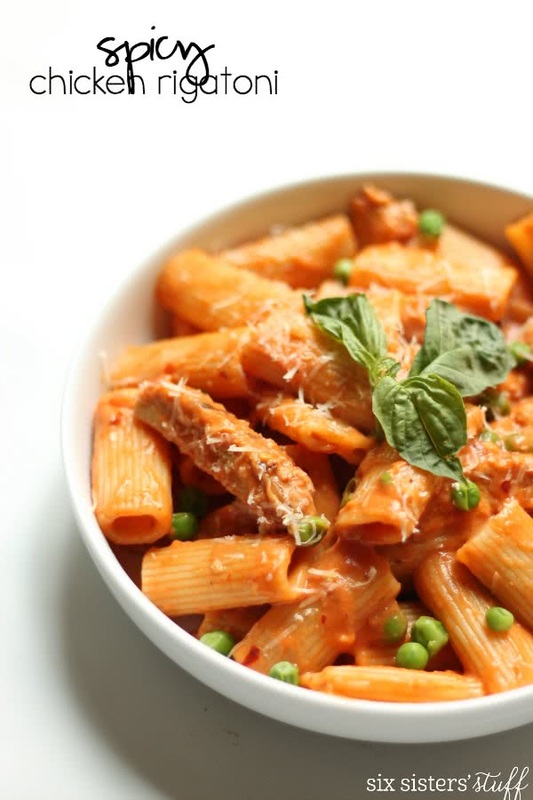 You know me and my boyfriend love a great chicken rigatoni recipe. Can you guys check out our recipe and maybe get back to us about it? We want to make this recipe perfect! Made this last night for my family and it was a hit! We loved it! I only fed 4 people and there was not much left over. They kept going back for more. It was simple and fast to make. I definitely will be making this again! I made it last night, Mom, Dad and 2 year old son all loved it. Would add more chicken, and no butter, in future.